Thanks for the awesome support and feedback. Keep it coming! It's never too late to send me your ideas. 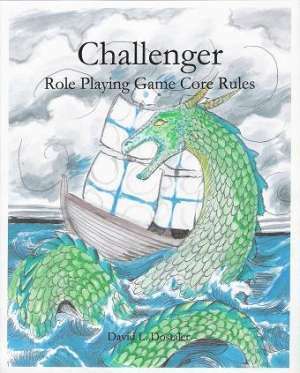 I've recently started the 3rd major overhaul revision on Challenger (see Challenger's Future here: http://www.challengerrpg.com/2012/04/challenger-next.html). It's going to take some time so I might not be able to post here as often as I might like. Don't worry. I'm still reading everything you send me! Don't consider it too late to have your ideas implemented into Challenger. I'm just working on it right now, it's not set in stone yet. If you have great ideas, please keep sending them my way. Thank you. I'd just like to say I feel good about this revision. Thanks mostly to Istaran, there are some very sweet ideas in the works and I think it'll improve the game a lot. I'm only hoping I can do your ideas justice, and perhaps lay out the book a little better and more clearly. Look forward to: more balanced mechanics, classes, and powers; Telekinetics and Summoners; a cleaner and simpler skill system (thanks Istaran); Weapon Damage and clearer equipment/weapon/armor tables (thanks Bocaj); a better introduction, glossary, and ToC (thanks to Mylon and Leane); a possible world lore section and achievements section; page borders (I hope. I have them, it's just formatting with the printers); possible better visual cues (filled out character sheet, maps, world map etc. ); and a dozen other 'little' tweaks to make the game: faster, more fun, and easier to use. Thanks for sticking it out with me guys. You're all awesome. May 26th Update: I'm....still....Alive! I added an Avengers in Challenger link above and my good playtesters are currently kicking the crap out of Challenger. I think this is awesome. If I can survive, Challenger will (hopefully) be 'way' better. Currently there is requested art on every single page, not sure if I'll manage that, but look forward to a lot more artwork! I'm also trying to fix the engagement and combat rules with the help of some very fine men and women. Thanks guys. I also added a link with an Open Game License for Challenger. Tell me what you think!